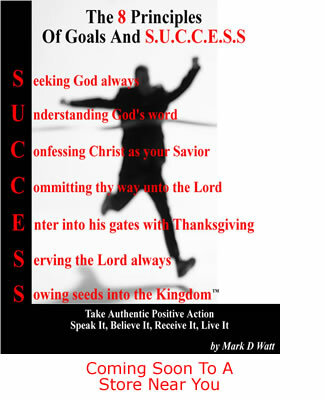 The 8 Principles Of Goals And Success | The 8 Principles Of Goals And S.U.C.C.E.S.S. Remember, having the wrong type of thoughts will bring forth the wrong type of words, and the right type of thoughts will bring forth the right type of words. What you are experiencing in your mental or your internal mindset will be manifested externally. It says… “For as he thinketh in his heart, so is he:” Proverbs 23:7a – KJV: As one (reckons), and the heart is the (inner-man or the mind). When it comes to what we speak, our words are like (packages or containers) that contain power in them. It says… “Death and life are in the power of the tongue:” Proverbs 18:21a – KJV: Need I say more? So how does one speak differently? You must change your thoughts. In other words, change your thoughts, change your vocabulary, and change your life. What you think and speak will affect the type of results that you desire. What do your desire, bad results or good results? 5. Apply thoughts of God to your life style on a daily basis. Remember that what is on the inside of you (your internal mindset) will display (externally). You live your life from the inside out. It is extremely important that we go from a carnal mindset to a spiritual mindset.